Are you writing a curriculum developer resume to land the perfect curriculum specialist or coordinator job? You’re in luck! You will find these resume tips helpful to write an excellent resume to target your dream curriculum developer position. These in-depth curriculum developer resume tips will help you to communicate the value you can bring to a school district or organization. Curriculum developers often feel like they are juggling many areas. They must keep many learning elements active at once in coordination with other education professionals to deliver effective lessons. Just as in music, the curriculum must remain in sync with the school’s educational philosophy while meeting foundational learning goals. Schools always have demand for teachers and administrators who can fulfill this challenging—yet fundamental—supervisory role. Your challenge in writing an effective curriculum developer resume is communicating how you dynamically integrate teaching approaches, learning styles and education materials into engaging classroom lessons that meet learning outcomes. Depending on the school or organization that is hiring, this position can be referred to as an instructional coordinator. Don’t forget to read and implement the many cover letter writing tips of teachers on this website. The cover letter is essential to make an excellent first impression. Districts and schools look for a balanced set of competencies when assessing job candidates for curriculum development positions. Identify these abilities in your curriculum developer resume by working backwards. First, define what an excellent curriculum includes. The quality and effectiveness of learning are tied to the curriculum and its continuous improvement. Learning as an ongoing development process can only be supported if the curriculum is responsive and adaptive to learning needs. Designing school curricula will involve a series of progressive steps, starting with defining the educational philosophy, reflecting the education approach, and integrating teaching methods. 1. Describe the scope of your curriculum development experience. Many teachers can develop lessons, which provides an opportunity to show instructional leadership. Communicate how you can meet the big picture learning objectives by integrating educational goals, learning approach, and teaching methodologies. The learning system you develop must be integrated and progressive to adapt to changing learning needs. Have you developed curricula for a subject, grade, school or district? If so, then note how many students the curriculum covers and their learning profiles. Demonstrate how you can work with district and school guidelines and develop teaching lessons that meet and teach to the state standards. Review this is curriculum developer job description on Study.com to determine the requirements of the position. 2. Show the types of curriculum development experience you have. Most curriculum development integrates different kinds of curricula to meet learning objectives. Was the content-driven curriculum designed for a particular subject and grade? Student-driven development takes into consideration the strengths and weaknesses, learning style, and challenges of the students. The purpose-driven curriculum targets specific learning problems. For example, a class may have lower than average math scores or special education needs. Include your curriculum development experience in the core competencies or areas of knowledge section. This resume section follows the profile at the top of a curriculum developer resume. Find more examples of resume keywords to include when writing a teacher resume or CV. 3. Describe your teaching materials and how you use them. A linear curriculum typically involves following a textbook. The multi-dimensional curricula more commonly used in today’s classroom could include books, videos, apps, and the internet. The textbook may or may not dictate the sequence of lessons. Material assembly often requires considerable coordination across, for example, district materials used (e.g., a popular math app), teacher’s preferred material, and new technology. The most effective curriculum specialist resumes include examples as evidence and proof of knowledge and experience. Show how your choice and use of learning materials adds value. Are you on top of technological changes in education—one of the greatest challenges of curriculum developers? If you can demonstrate how you have improved learning outcomes by integrating innovative technology into the curriculum, you will show your value to a school district. Following are some of the online teacher educational resources I use to gain ideas and inspiration for teaching materials. 4. Explain your curriculum development and teaching philosophy. Your teaching philosophy will have a substantial impact on the direction of the curriculum you develop and is therefore of prime importance to a district or school. 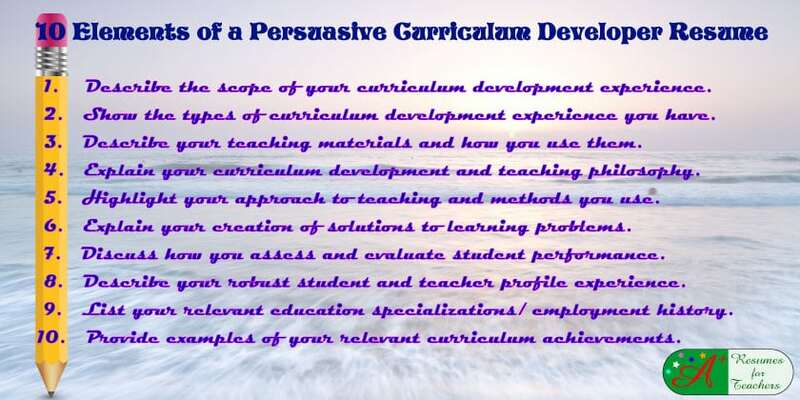 Unlike your education philosophy statement, your view towards curriculum development should be less personal. A 600-700 word summary of your teaching philosophy may be submitted with your resume and cover letter. It should mention the teaching approaches, methods, and styles you employ. How you define the process of learning and learning solutions is relevant. Review education philosophy writing tips to ensure you have included key points. 5. Highlight your approach to teaching and methods you use. The district will want to know if you have experience in the teaching strategies and methods it uses or plans to use in the future. Your teaching approach and style are a foundation of curriculum development, around which you will design your lesson plans and materials. To connect with schools, list specific teaching methods or techniques such as class participation, demonstrating, inquiry-based learning, cooperative learning, and direct instruction, differentiated instruction, learner-focused, class action research, debriefing, and peer-to-peer learning. 6. Explain your creation of solutions to learning problems. Problem identification is part of the performance assessment process. An example demonstrating the integrated process of continuous curriculum development, assessment of student performance and success, problem identification and solution development will demonstrate an integrated, progressive system with a working feedback system. Including in this may be remediation solutions for learners falling behind and enrichment for those who are ready to move ahead of the rest of the class. 7. Discuss how you assess and evaluate student performance. Effective curriculum developers make changes to school curricula when necessary. Integral to this continuous improvement process is a performance assessment system to identify learning issues. The effectiveness of the performance evaluation system will determine how responsive the curriculum is to learning needs. Curriculum developers should show a capacity to use self-reflection and evaluation in education. Provide examples in your resume to show knowledge in curriculum design. Show how the performance system is aligned with the curriculum. Demonstrate your mastery of different types of learning assessments – foundational knowledge, core competencies, task performance, and real-world problems. Research the methods used by the school district and use their concepts, such as balanced and authentic assessments, if applicable. The more you tailor your curriculum developer resume, the easier it will be for the school community to match their needs with your skills and abilities. 8. Describe your robust student and teacher profile experience. Mainstream students have different learning needs than special education students. Most curriculum specialists or developers today need to show the ability to develop curriculum for the inclusive classroom, involving a diverse set of learning styles and interventions (e.g., remediation, enrichment). Teacher experience and specialization should showcase your strength in curriculum development. 9. List all of your relevant education specializations/ employment history. Curriculum developers come from many different backgrounds. Opportunities exist to transition into and out of education. A developer of corporate training programs may be seeking to transition to education. Many possibilities exist in ESL curriculum development or other areas in education. A fast-growing ESL market overseas can provide you with an opportunity to gain experience. Another high growth area is curriculum development for technical training. List any areas you specialize in – science, technology, environment, math, online instruction, music, or physical education. 10. Provide examples of your relevant curriculum achievements. Curriculum developers that are competing for the same jobs could be using the same terms to describe teaching and assessment approaches and methods. You can distinguish yourself by providing examples. Performance metrics, in particular, are influential in a resume or cover letter. Describe by how much you improved learning outcomes. Have you introduced new teaching methodologies or innovative uses of technology? How did they affect student performance? Curriculum developers have many transferable skills and are often in demand in the education as well as other sectors. If you want to work as an independent contractor, see how to write an education consultant resume and market yourself. If you are a teacher wishing to transition to a curriculum specialist position, your cover letter and resume should communicate your qualifications, related experience, and passion. Remember, as a curriculum developer; you will have many projects at one time. Broad teaching knowledge is an asset and should be communicated in your curriculum developer resume. Take workshops in the primary teaching methods to demonstrate your mastery of them. Become a performance assessment specialist. To gain experience, take volunteer positions in curriculum development. Develop the curriculum for your summer camp or daycare program. Another idea, take an entry-level position in the ESL job market. Review our resume and cover letter samples to gather ideas on how to distinguish your resume from the other resumes targeting the curriculum specialist position. Need some writing help making an attention-grabbing curriculum developer resume, cover letter, or CV curriculum vitae? Take the time to review and order one of our resume packages or individual services. Learn more about Candace Alstad-Davies by checking out this about me page. From that page, you can review testimonials and frequently asked questions. I would enjoy answering any questions you may have. Don’t hesitate to send an email to Candace or call toll-free at 1 877 738-8052.